When Southern Californian Justin Pinchot is in the market for a new car, he doesn't just head for the local Auto Row or browse the latest deals online. He goes farther, a lot farther. For example, a British Columbia mechanic located his latest ride, a 1950 Tatra T-600 Tatraplan, in a Canadian barn. 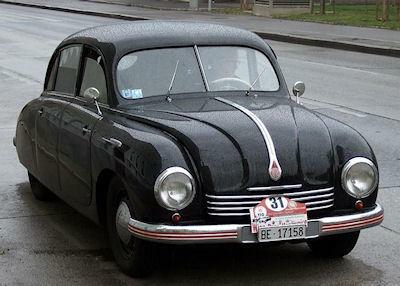 How a four-door, teardrop-shaped import from then-communist Czechoslovakia ended up in a Canadian barn is a complicated story involving war reparations, wheat exports, and anti-communist hysteria. After its initial discovery in a B.C. barn, the car changed hands several times, but recently, Pinchot finally became the proud owner of this black beauty.